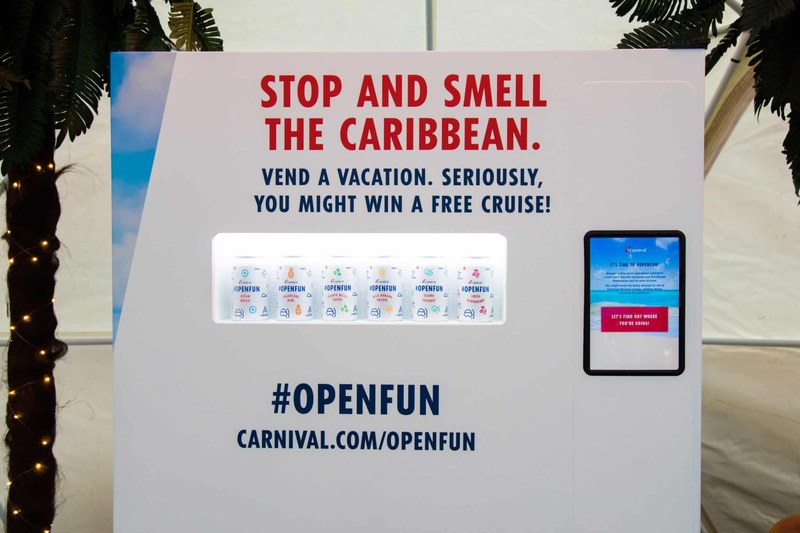 Carnival designed this activation to give consumers a “whiff” of their next vacation after a recent survey conducted by the cruise line found that 95% of Americans agree that scent can trigger vacation memories and 56% agree that a particular scent has motivated them to plan a vacation. 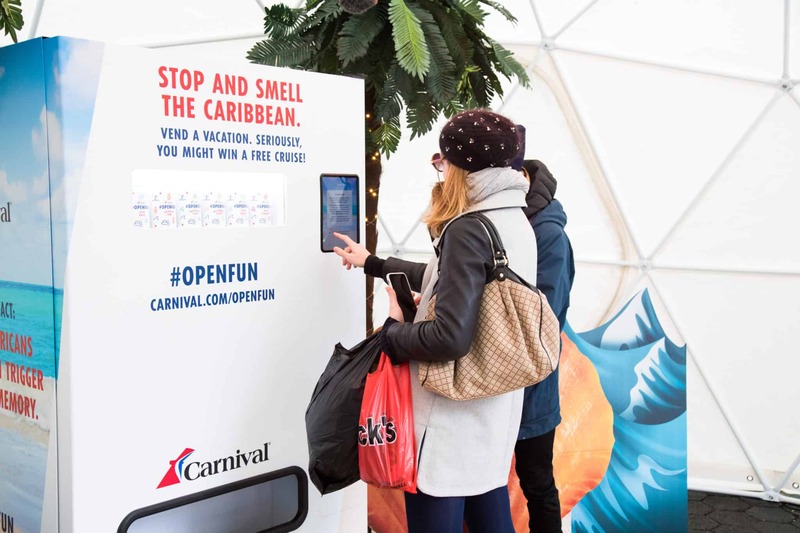 Carnival brought the magic of a Caribbean cruise to the mainland with an interactive and immersive pop-up activation, featuring a heated tent, a steel drum band, and scents from the islands piped throughout the air. With winter approaching, now is the time for consumers to start thinking about an escape from the cold and begin planning their next Caribbean vacation. To celebrate the Caribbean’s stunning island destinations and promote the launch of its newest ship, Carnival Horizon, Carnival Cruise Line captured and canned real island air from tropical ports of call and invited New Yorkers to stop and smell the tropics with a truly unique and “scent-sational” experience that took place in Manhattan’s Greeley Square Park. The event’s centerpiece was a vending machine dispensing the chance to win a Carnival cruise and free cans of real island air infused with natural scents unique to each destination. Featured scents included Wild Banana Orchid from Grand Cayman, Puerto Rican Coffee from San Juan, Sugarcane Rum f rom St. Kitts, Island Coconut from Cozumel, and Ocean Breeze from the sea – all representing the places that Carnival Horizon will be visiting during her Caribbean itineraries. In conjunction with the New York City promotion, Carnival is hosting a national sweepstakes on its social channels (Twitter, Instagram, and Facebook) through Dec. 16 that asks people to share what scent inspires them to vacation using the hashtag #OpenFun for a chance to win a cruise on the line’s newest ship. “As winter is fast approaching, now is the time to start thinking about your next vacation,” said Stephanie Esposito, director of digital marketing for Carnival Cruise Line. “Our #OpenFun campaign is designed to promote travel to the Caribbean – the world’s most popular cruising region – by encouraging consumers to stop and smell the tropics, get a ‘scents’ of what a cruise experience might be like, and maybe win a cruise vacation,” she added. Currently under construction at the Fincantieri shipyard in Marghera, Italy, Carnival Horizon will offer unique features like the first-ever Dr. Seuss-themed water park, the new Smokehouse Brewhouse with traditional downhome BBQ favorites created by Food Network star Guy Fieri along with brewed-on-board craft beers at an onboard brewery, and the line’s first teppanyaki dining venue. Other innovations include a groundbreaking bike-ride-in-the-sky attraction called SkyRide, an IMAX Theatre, and a suspended ropes course that’s part of the fun-filled SportSquare open-air recreation area. A wide range of accommodations will also be offered, including spa cabins offering exclusive privileges at the Cloud 9 Spa, extra-roomy staterooms in Family Harbor, and tropical-inspired Havana staterooms and suites with exclusive daytime access to a Cuban-themed bar and pool. Following its inaugural European season, Carnival Horizon will launch a summer schedule of four-day Bermuda and eight-day Caribbean voyages from New York before repositioning to Miami for year-round six- and eight-day Caribbean cruises beginning in September 2018.